Some women want to develop much stronger vaginal muscles than others. The basic weight lifting principles apply - repetition builds muscle tone and definition, weight (or force) builds strength. 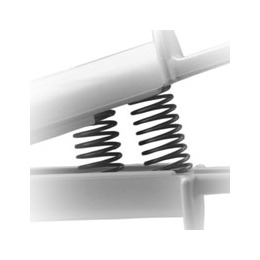 When you feel your vaginal muscles have become too strong for the first set of springs you can buy this special set of stronger springs. To squeeze these strong springs will require more than double the force of the normal springs and therefore significantly increase the benefit of the PelvicToner for those who want to increase their vaginal muscle strength. Below are reviews of Strong Spring Set for PelvicToner by bodykind customers. If you have tried this product we'd love to hear what you think so please leave a review. A stronger set of springs for your PelvicToner for a tougher workout and even stronger pelvic floor muscles.